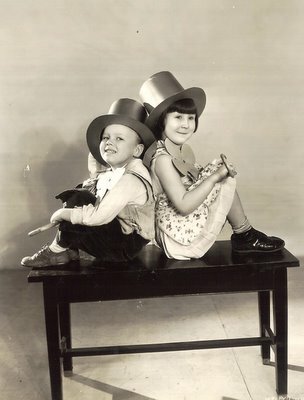 Here’s an interesting shared birthday between employer and employee --- Hal Roach and Our Gang favorite Mary Ann Jackson. He, of course, was the producer of that venerable series of "Famous Kid Comedies" and she was one of its shining stars during the late twenties. A lot of us grew up on the Our Gangs, or as they’re better known, The Little Rascals. I hesitate to use the term "better known", owing to the sad fact that these short comedies have pretty much disappeared from the cultural landscape over the past thirty years. Those of us who still remember the Gang often betray our age in any conversation with young people where this series comes up. Kids just don’t know the Rascals any more. Nobody shows them on TV, and DVD availability is limited to spotty and indifferent efforts on the part of their current owner, Hallmark Cards. For most of us, Our Gang really was an essential part of growing up in the sixties. They’d been popular in the theatres when they were new, of course, but with television, one could enjoy the entire oeuvre again and again into a kind of viewing infinity, where songs, catch-phrases, and even physical gestures, could be borrowed from the series and incorporated into schoolyard habits and rituals. Where I lived, we had a Rascals show that was emceed by a region-based singing cowboy named Fred Kirby. Fred was a benign, genial host each Saturday and Sunday, when he would call the televised meeting of The Little Rascals Club on WBTV in Charlotte. If you wrote in to Fred, chances are your name would be mentioned on the air. One Saturday morning, he read my name, and pronounced it right in the bargain! Bless his heart. Fred kept a busy schedule too. He held theatre parties, where he’d perform on stage, then introduce Rascal comedies to the live audience. That must have been great. He came to my town in 1960, but I missed him. Still regret that. Fred used to visit children in the hospital as well --- he did that a lot --- and nobody paid him for it. Has that sort of kindness gone out of fashion? A major gig for him was summers at a place called Tweetsie Railroad, located in the Blue Ridge vicinity of North Carolina. As that old train huffed and puffed its way around the mountain, Fred would be on hand to quell occasional indian attacks, blazing six-shooters at the ready. Otherwise, he'd be available in the park area to sign autographs and pose for pictures with kids. You may rest assured there are, at present, tens of thousands among us Tweetsie veterans still clinging to treasured Brownie snapshot of ourselves with Fred. After a phenomenal TV run in excess of thirty years, Kirby retired from the station, then died in 1996 at the age of 86. My one encounter with him came late in that fabulous career, but it was memorable. This was 1984, and I happened to be at Tweetsie when up came a rainstorm, one so powerful that even Fred was obliged to seek refuge under the platform shed. Seeing him sitting there alone, waiting out the downpour, I seized opportunity and approached him. What I experienced was about as enjoyable a twenty minute conversation as one could hope for. He answered every question (and some of them had to have been annoyingly specific), while sitting patiently in his drenched cowboy suit waiting for the rain to subside. A wonderful man. Well, back to Mary Ann Jackson. She’s one Rascal who did not have a tragic aftermath (surprise! ), having moved on to a reasonably conventional real-life after graduating from the series. Little Wheezer, who’s shown in the picture with her, was not so fortunate. We understand he was blown up in a grenade accident at a training camp during WW2. Mary Ann was one of the more reticent Rascals, less inclined to bask in the reflected glories of her movie past. A few selected appearances, autographs here and there, but not the type to hang around the dealer’s room at a show for twelve hours at a stretch (Bless you for that, Dorothy De Borba). Mary Ann had a distinctive Gang personality, having come into the series a seasoned vet of a popular Mack Sennett group she’d done for several seasons previous. Mary Ann died in 2003 at the age of 80. About Hal Roach. Did anybody live as long as this man? Charles Lane surpassed him for longevity, I know, but for years, before his death at 100, Roach was the living and walking embodiment of the eternal Hollywood pioneer. 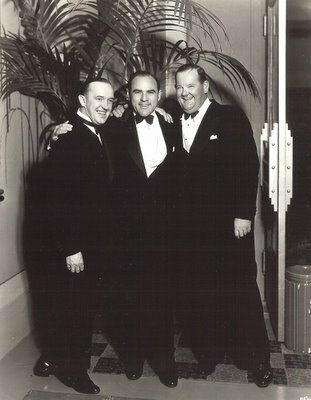 I remember seeing one of those Entertainment Tonight segments where they were celebrating Hal's 100th at the Hollywood Roosevelt, and Jay Leno was waxing effusive about how it was one thing to meet someone who had worked with Laurel and Hardy, but to meet the guy who created Laurel and Hardy! Even hardened, seen-it-all showbizzer Jay was in awe. Here is Hal with his immortal comedy team at a dinner celebration of Roach’s twentieth year in pictures. Nice to see the boys in formal attire.